Color Wire Needle Threaders  - $1.50 : Yarn Tree, Your wholesale source for cross stitch supplies. Item 3391. 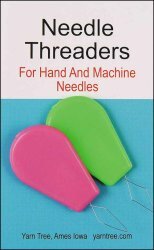 Color Wire Needle Threaders have a colorful grip so they are easy to find in your stash. For hand and machine needles. Two per pack.